Day 1: After an intense week of bus travels through Bolivia it’s time to go by airplane to Cusco, Peru. We’re ready to live the Inca lifestyle for a few days and hopefully catch a glimpse of Machupicchu! 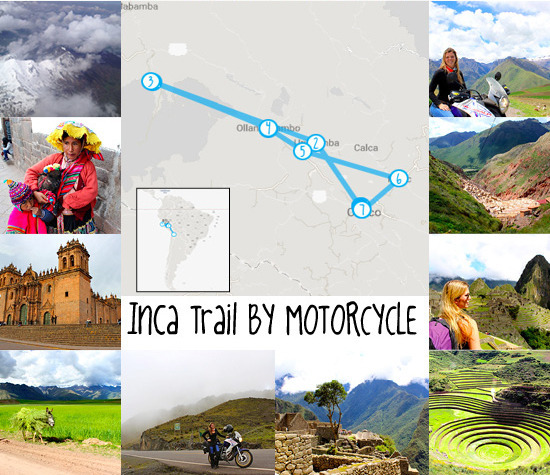 Day 2: Today we go and explore Cusco as well as our options for motor rentals! What an amazing city this is with all its colors and especially its altitude (3.400m). The altitude sickness is something that we should try to avoid; chewing coca leaves provides a great way of prevention. Day 3: The plan was to rent a motor for one day and to explore just the Sacred Valley, but now that we’re getting used to the altitude we’re dreaming about a motor trip for several days so that we can reach Machupicchu by ourselves! A 650cc motorcycle will be our best friend for the next 5 days. Day 4: Very early in the morning we wake up to start our motor adventure on time. I feel as if we are driving through Germany for the first part of the trip, but after a while it just keeps on getting more and more amazing. The views are stunning. We have lunch in a place called Ollantaytambo without realizing what this place really is. After finishing a nice local meal of “Alpaca” we jump back on the motor and see that a huge Inca ruin was right in front of us. Very nice! We still have to drive through the mountains with probably some rain, mist, snow and the dark night before we reach our first destination: Santa Teresa. Day 5: After having arrived yesterday to Santa Teresa, after all indeed completely wet by the rain, we found a lovely Eco Lodge named Quechua where we woke up this morning. Breakfast is served and Machupicchu is awaiting us! We spend the entire day walking around at the ruins of the best-kept Inca secret, but afterwards we deserve a dip into the natural hot springs of Santa Teresa. Day 6: The road is ready for us again and unfortunately some rivers, which we really have to cross, are too. It all works out though and our adrenaline gets a real boost today. We arrive back at Ollantaytambo again by the end of the day. Day 7: After waking up in Ollantaytambo it’s time to hit the road again. Today we make our way back to Cusco, but first let’s visit Maras with its salt mines and the surprisingly perfect round Inca ruins! Next Post The Favoroute office is getting busy!